The Basic Science department has well professionally qualified, experienced and skilled staff. The department is considerably achieving good results. The department aims at to impart value based education through teaching fundamentals with practical approach to meet the current societal requirements. We educate the students with the capacity to solve the real world problems that leads to the economical and technological transformation of the country. The Basic Science department is committed to continuously improving the quality of education by enhancing the knowledge of students. The department aims at striving hard, incorporating innovative methods in teaching and letting them know the real world applications. Enabling the students to face the fast changing world and technology. Imparting quality education in various domains like physics, chemistry, mathematics, etc. Creating an inspired atmosphere through teaching and teaching aids. To providing the students a strong foundation through course and hence helping to adapt themselves to the need of industries, research and higher education. The Basic Science department is supported with necessary infrastructure consisting of spacious classrooms and well equipped laboratories to support the university syllabus requirements. The department is supported with eight classrooms along with two laboratories. Objective : General familiarity with the following areas in chemistry: analytical , inorganic, organic and physical. The ability to work effectively and safely in teams as well as independently in a laboratory environment. The Tutorial Room is supported with green glass board and the seating arrangement for 50 students. Dr. Vinay Venugopal, M.Sc., Ph.D. ; Professor & Head. Sowmya G M, M.Sc, PGDCA, MISTE; Assistant Professor. Priyadarshini K M, M.Sc; Assistant Professor. Dr. Bellappa S, M.Sc., B.Ed., Ph.D., MISTE ; Professor & Head. Sheshadri S N, M.Sc., M.Phil., M.Ed., (Ph.D) )MISTE ; Assistant Professor. Dr.Renuka N, B.Sc, M.Sc., Ph.D, Assistant Professor. Santhosh M V, B.Sc, M.Sc, (Ph.D), Assistant Professor. Dr.A T Eswara, M Sc, Ph D, FSSc, LMIAM, LMISTAM, LMVPI, LMISTE, Professor and Research Supervisor. Roopadevi K N, M Sc, (Ph.D), LMISTE Associate Professor. Santhosh Kumar P N, M Sc, LMISTE, Assistant Professor. Santhosh K N, M Sc, LMISTE, Assistant Professor. A Special Talk “NMR: Instrumentation and Applications"
Former Director, Health Safety & Environment Group, Bhabha Atomic Research Centre (BARC), Mysuru. Technical Officer, Department of Spice and Flavor Science, CFTRI, Mysuru. Department of Mathematics, NIEIT, Mysuru. Dr. Pradeep G Siddeshwar, Professor, Department of Mathematics and Director of Planning, Monitoring and Evaluation Board, Bangalore University, Bengaluru. Dr. Chandrashekara A, Officer Head, Bhabha Atomic Research Center (BARC), Mysuru. Dr. Siddaramiah, Professor, Department of Polymer Science & Engineering, SJCE, JSS Science & Technology University, Mysuru. Central Institute of Plastics Engineering & Technology (CIPET), Mysuru. Chief Scientist and Head, Department of Microbiology and Fermentation Technology, CSIR-CFTRI, Mysuru. Professor, Dept. of Mathematics, RVCE, Bangalore. Mr. Raghavendra Prasad M D Founder & Managing Director, Bhamys Group of Compaines, Mysuru. Dr. K Natarajan, Prof. & Head Dept of Chemistry and Director- Advanced polymer lab, R.V.College of Engineering, Bangaluru. (From right) Lingaragaiah, Executive Officer, Mysuru Taluk Panchayat, Venkataseshaiah, Associate Prof. and Head, Dept. of Mathematics, Praveen K N, Assistant Director, SVEEP, Mysuru, Manjula Patil, CDPO Mysuru, Ramya, DDLR Mysuru, and Dr. Vinay Venugopal, Prof. and Head, Dept. of Physics, GSSSIETW, Mysuru. B.E. students of GSSSIETW, Mysuru taking oath related to voting duties and responsibilities during voter awareness program of SVEEP Committee. The Department of Basic Science and Electoral Literacy Club, GSSSIETW, Mysuru organized a voter awareness program by Systematic Voters Education and Electoral Participation (SVEEP) Committee on 04 April, 2019 at GSSSIETW, Mysuru for B.E. students. Sri. Lingarajaiah, Executive Officer, Mysuru Taluk Panchayat spoke about the importance of taking part in voting process which is the backbone of successful democracy. Sri. Praveen K N, ZP Assistant Statistical Officer spoke about the important role of youth in the voting process and how they should motivate their family members to vote. Smt. 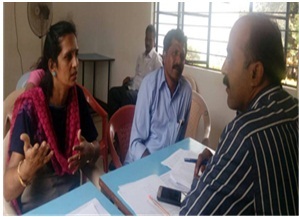 Ramya, Deputy Director Land Record, informed about vigilance app (cVIGIL) related to the upcoming Lok Shabha elections and alerted the students to report electoral malpractices. She initiated a signature campaign by the students to install and use cVIGIL. Smt. Manujula Patil, Child Development Program Officer conducted an oath taking by students and faculty members concerning voting duties and responsibilities. The students of B.E., faculty members of Basic Science, HODs of engineering departments, Faculty Coordinators of Electoral Literacy Club (ELC), Dr. Pradeep Kumar R, Assistant Professor, Dept. of Mathematics and Abhishek A S, Assistant Professor, Dept. of Physics, Sri. Venkataseshaiah, Associate Professor and Head, Dept. of Mathematics and Dr. Vinay Venugopal, Professor and Head, Dept. of Physics, GSSSIETW, Mysuru attended the awareness program. (From left - sitting): Dr. Reshma Banu, Professor and Head, Dept. of ISE, Mrs. Sangeetha Sridhar, Dr. Shivakumar M, Principal, GSSSIETW, Mysuru and Dr. Vinay Venugopal, Professor and Head, Dept. of Physics, GSSSIETW, Mysuru. (standing) Faculty and student co-ordinators of Nature Club, GSSSIETW, Mysuru. The Department of Physics and Nature club GSSSIETW, Mysuru recently organized a talk on Clean India Trail by Mrs.Sangeetha Shridhar who is self driving, travelling India on a solo journey across 290 cities in India. Ms. Sangeetha said that it is a Gandhian Yatra for Clean India Safe India marking Gandhi150, already covering a distance of over 43000 km in the past 200 days of solo road trip. It is a world record for sanitation UNSDG6. She suggested the students to adopt aspiration, courage, diet and excellence to achieve excellence in the life. She said people can see different types of places which they want to see abroad in India itself. Ms.Sangeetha explained the details about her food habits, time management, fitness that helped to sustain her journey and also how she faced the challenging situations during her journey. At the end in the interaction session she answered many questions posed by the students. Dr. Shivakumar M, Prinicipal, GSSSIETW, Mysuru also addressed the gathering. Dr. Vinay Venugopal, Professor and Head, Department of Physics, GSSSIETW, Mysuru, all the HODs, faculty members, student coordinators of Nature Club and first year BE students of GSSSIETW, Mysuru attended the program. From left: Dr. Bellappa S, Professor and Head, Department of Chemistry, Dr. Purushottam Pradeep, CEO-Bhavaspandana Organization & Swasth Bharath Abhiyan, Smt. Vanaja B Pandit, Hon. 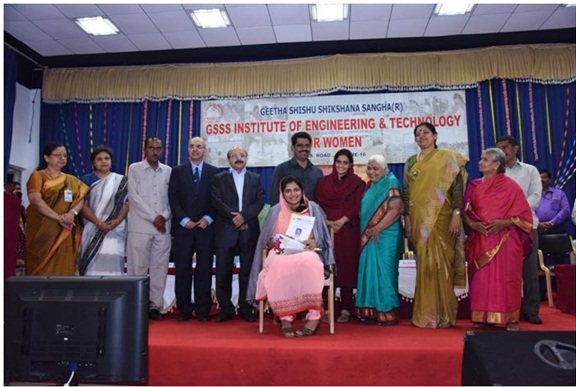 Secretary, GSSS (R) & Dr. Shivakumar M, Principal, GSSSIETW were seen on the occasion. Photograph of Dr. Purushottam Pradeep during the session. 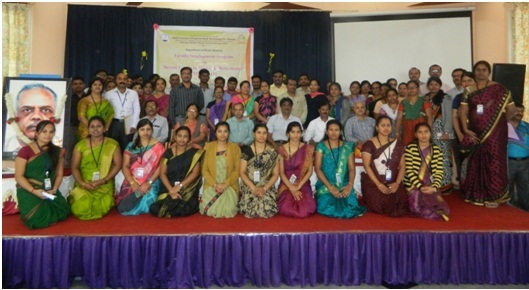 A Special talk on “Cervical and Breast Cancer Awareness for Women” was organized by Department of Chemistry in association with NSS Unit of GSSSIETW, Mysuru under Science Forum on 1st April 2019. Dr. Purushottam Pradeep, CEO-Bhavaspandana Organization, Swasth Bharath Abhiyan and Indo-Asia Cervical Cancer Prevention Wing, Government of India was the Guest Speaker. Dr. Purushottam Pradeep got his Ph.D. at the age of 25 years from the American Cancer Research University. He also got Young Scientist award from the Govt. of India in the year 2016. He was awarded with prestigious Pal P Harries award by the International Rotary association. His name has been entered in Gunnies Book of Records for arranging more number of Health camps across India. In his talk, he explained about the Causes, Symptoms and Prevention of Cervical and Breast Cancer. He emphasized the importance of creating awareness about Cervical & Breast Cancer which is the most widespread among the women of India. In this regard there is a need for educating people for early detection of cancer greatly increases the chances for successful treatment. The event was presided by Smt. Vanaja B Pandit, Hon. Secretary, GSSS(R). Dr. Shivakumar M, Principal, Dr. Bellappa S, Professor and Head, Department of Chemistry, GSSSIETW, HOD’s, Staff and Students were present on this occasion. From Left: Dr. Shivakumar. M, Principal, GSSSIETW, Sri. 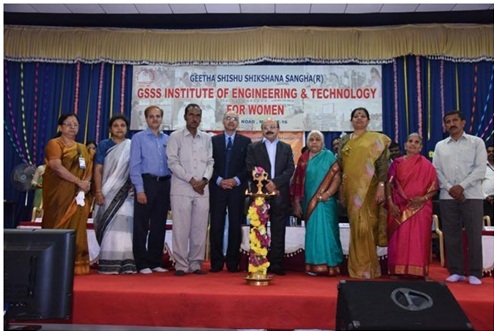 R. K. Bharath CEO & MCM GSSS(R), Chief Guest, Smt. Lalitha Rajanna, Siddhartha Nagara, Mysuru, Smt. Vanaja B Pandit, Hon. Secretary, GSSS(R), Smt. Anupama B Pandit, AAO, GSSSIETW. From left: Prof. Yogesh M, Associate Professor & Head, Dept. of Mechanical, Dr. Pushpalatha H L, Professor & Head Dept. of Physics, Dr. Shruti Pandey, Senior Scientist, Department of Grain Science and Technology, CSIR-Central Food Technological Research Institute (CFTRI), Mysore, Dr. A T Eswara , Professor & Head, Dept. of Mathematics, Dr. Bellappa S, Professor & Head, Dept. of Chemistry. Dr. Shruti Pandey addressed the First year B.E. students. In her talk she introduced the concept of grains, various types of grains and its silent features. Explained about nutritional value of various grains, processing of grains, losses during processing, combating the processing losses, fabrication techniques, merits and demerits. 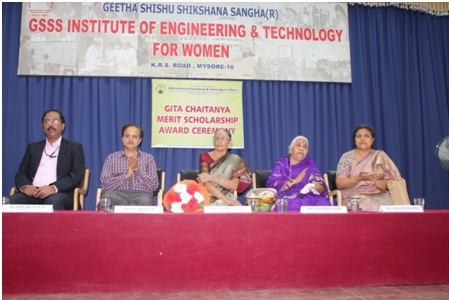 Seen from left to right : Dr. Sumithra Devi K A, Principal, Smt. Anupama B Pandit, AAO, Sri R K Bharath, Member, GSSS(R) and CEO, GSSSIETW & Sri Srinivas Gupta, Vice President, GSSS(R), Dr. M R Nayak, Advisor to Director and Head, AESD, National Aerospace Laboratories (NAL), Bengaluru, Dr. M Jagannatha Shenoi, President GSSS(R), Smt. Vanaja B Pandit, Hon. Secretary, GSSS(R), Dr. Dharanidevi Malagatti K, Superintendent of Police & Principal, Police Training School, Mysuru, Smt. Ratnamma Kenche Gowda, Member GSSS(R), Sri B K Nataraj, Administrative coordinator & Member GSSS(R). 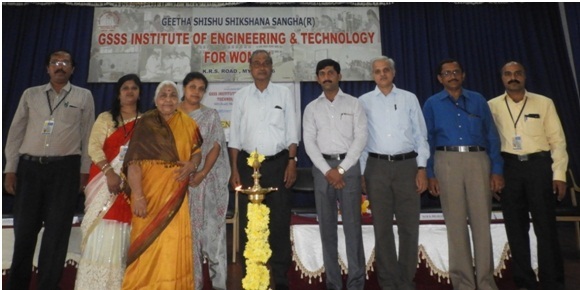 GSSS Institute of Engineering and Technology for Women, Mysuru, organized Inaugural Programme for First year B.E. students for the academic year 2017-18 on 5th August 2017, Saturday at 10 AM. Dr. Dharanidevi Malagatti K, Superintendent of Police & Principal, Police Training School, Mysuru, was the Chief Guest of the inaugural function. In her inaugural speech, she addressed the students that Technology & innovation should not be used in the wrong manner but it has to be used for acquiring the knowledge to face the competitive world and also wished all the first year students for bright future. Dr. M R Nayak, Advisor to Director and Head, AESD, National Aerospace Laboratories (NAL), Bengaluru, was the Guest of honour. In his speech, he advised to develop scientific spirit in life. He emphasized to keep your dream alive and choose the right way of life. On this occasion college Magazine ‘GEETHA VAIBHAVA 2017’ was released by the dignitaries. The dignitaries honored VTU 8th rank holder Kum. Ramzeena, Computer Science and Engineering, with Rs. 10,000 cash prize and Certificate of Appreciation. The function was presided by Dr. M. Jagannath Shenoi, President, GSSS(R), Mysuru. All the department HOD’s and Staffs were present on this occasion. A photograph of first year students along with parents during the inaugural function. Felicitation to Kum. Ramzeena, 8th Rank holder of VTU. From left: Yogesh M, Associate Professor & Head, Department of Mechanical, Dr. Sumithra Devi K A, Principal, Dr. H L Pushpalatha Professor & Head, Department of Physics, Sri. P V Shashikumar, Retd. Director, Central Manufacturing Technology Institute (CMTI), Bengaluru, Dr. Bellappa S, Professor & Head, Department of Chemistry were seen. Department of Basic Sciences, GSSSIETW, Mysuru organized Three days FDP on “Recent Trends in Nano Science & Technology” (RTNST-2017) from 12th to 14th October 2017 in Seminar hall. The FDP was inaugurated by Sri P V Shashikumar, Retired Director, Central Manufacturing Technology Institute (CMTI), Bengaluru. In the inaugural speech, he emphasized the importance of Research and innovations in Nano Science and Nano Technology. During this FDP, experts in the field of Nano Science and Technology delivered series of lectures on recent innovations in Nano Science. 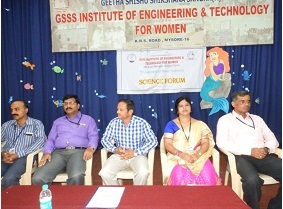 About 40 faculties from GSSSIETW and various Engineering colleges of Mysuru, were actively participated in the program. 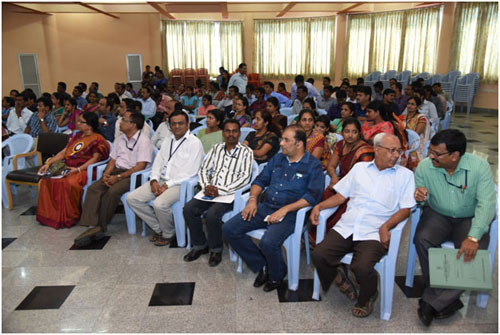 From right: Dr. Shivakumar M, Prof. & Head, Dept. of Electronics & Instrumentation Engineering, Sri R K Bharath, Member, GSSS(R) and CEO, GSSSIETW, Smt. Anupama B Pandit, Assistant Administrative Officer, GSSSIETW and Smt. Vanaja B Pandit, Hon. Secretary, GSSS(R) Mysuru. Department of Chemistry, GSSSIETW, Mysuru, organized Kannada Rajyothsava Celebration - 2017 on 02nd November 2017 in M Govinda Rao Memorial Hall at 2.00 PM. The programme was presided by Smt. Vanaja B Pandit, Honarary Secretary, GSSS(R), Mysuru. During this occasion, students performed various cultural events like Bharathanatyam, Violin, Group song and Drama (Alumellammana Shaapa). The program was ended by the National Anthem. 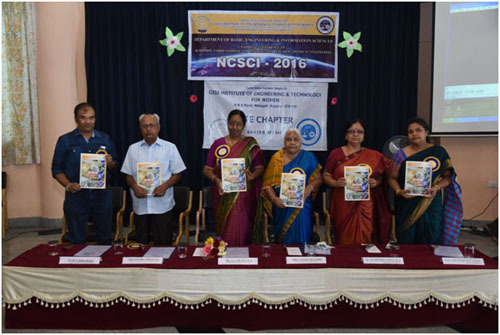 (From left): Yogesh M, Associate Professor and Head, Department of Mechanical; Dr. Bellappa S, Professor and Head, Department of Chemistry; Dr. Prapulla S G, Chief Scientist and Head, Department of Microbiology and Fermentation Technology, CSIR-CFTRI, Mysuru; Dr. Pushpalatha H L, Professor and Head, Department of Physics; Dr. A T Eswara, Professor and Head, Department of Mathematics. 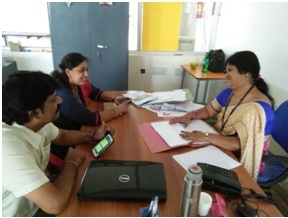 (From right): Prof. M A Chandrashekara, Educationist and Advisor, GSSS(R); Dr. Sumithra Devi K A, Principal; Smt. Vanaja B. Pandit, Hon, Secretary, GSSS(R); Smt. Anupama B. Pandit, Assistant Administrative Officer; Sri R K Bharath, Member and Chief Executive Officer, GSSS(R), Mysuru. 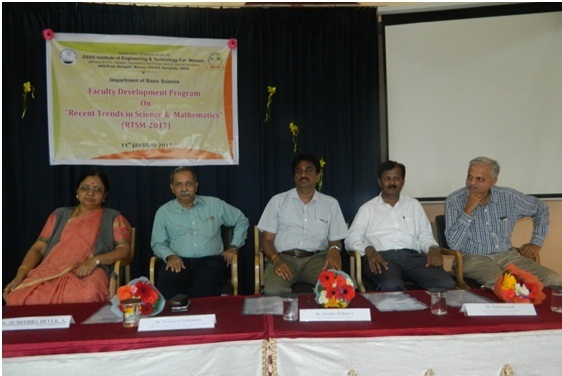 (From left) Dr. Sumithra Devi K A, Principal, GSSSIETW, Mysuru; Dr. Pradeep G Siddeshwar, Professor, Department of Mathematics and Director of Planning, Monitoring and Evaluation Board, Bangalore University, Bengaluru; Dr. Chandrashekara A, Officer Head, Baba Atomic Research Center (BARC), Mysuru; Dr. Siddaramiah, Professor, Department of Polymer Science & Engineering, SJCE, JSS Science & Technology University, Mysuru; Sri R K Bharath, Chief Executive Officer and Management Committee member, GSSS(R) were seen. 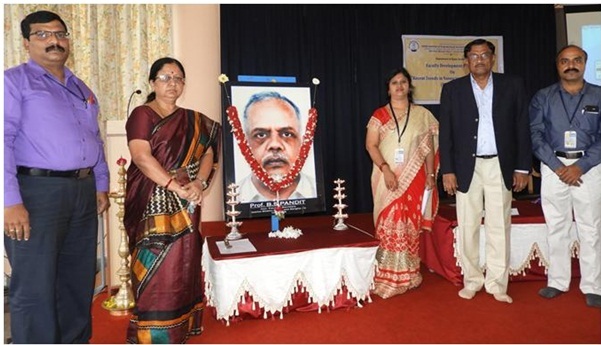 (From left): Dr. A T Eswara, Professor and Head, Department of Mathematics, GSSSIETW, Mysuru; Dr. Pushpalatha H L, Professor and Head, Department of Physics, GSSSIETW, Mysuru; Chi. 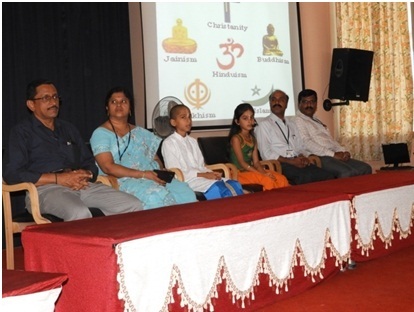 Abhigya Anand, Child Prodigy, Mysuru; Chi. Abhideya, Child Prodigy, Mysuru; Dr. Bellappa S, Professor and Head, Department of Chemistry, GSSSIETW, Mysuru; Yogesh M, Associate Professor and Head, Department of Mechanical, GSSSIETW, Mysuru. A Special Talk on “An Overview of Engineering Mathematics” was delivered by Dr. K. S. Chandrashekar on 11th March 2017 to all first year B.E. 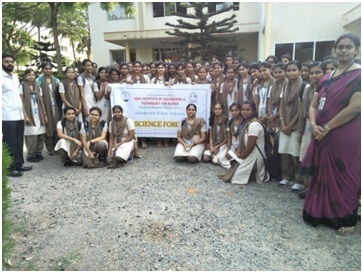 students under Science Forum, GSSSIETW, Mysuru. (From left): Dr. Pushpalatha H L, Professor & Head Dept. of Physics, GSSSIETW; Sri. Yogesh M, Associate Professor & Head, Dept. 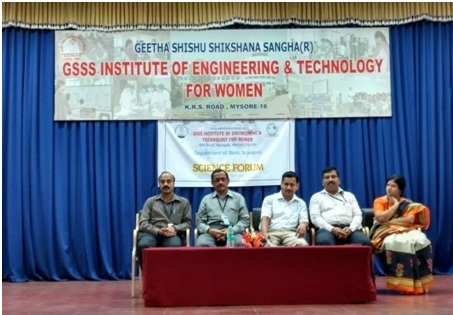 of Mechanical, GSSSIETW; Dr. K. S. Chandrashekar, Formerly Professor, Department of Mathematics (NIE, Mysuru); Dr. A T Eswara, Professor & Head, Department of Mathematics, GSSSIETW; Dr. Bellappa S, Professor & Head, Dept. of Chemistry, GSSSIETW. 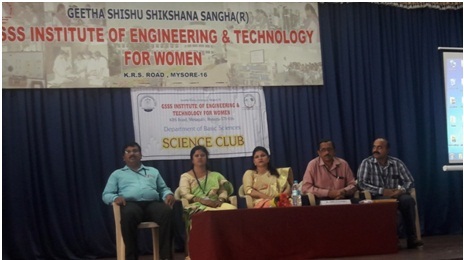 (From left) Dr. Shivakumar M, Professor and Head, Department of Electronics and Instrumentation Engineering, GSSSIETW, Mysuru; Dr. Pushpalatha H L, Professor and Head, Department of Physics, GSSSIETW, Mysuru; Smt. Vanaja B Pandit, Hon. Secretary, GSSS (R), Mysuru; Smt. Anupama B Pandit, Asst. Administrative Officer, GSSSIETW, Mysuru; Dr. D V Gopinath, Former Director, Health Safety & Environment Group, Baba Atomic Research Centre (BARC), Mysuru; Dr. Anil Kumar K, Technical Officer, Department of Spice and Flavour Science, CFTRI, Mysuru; Sri. 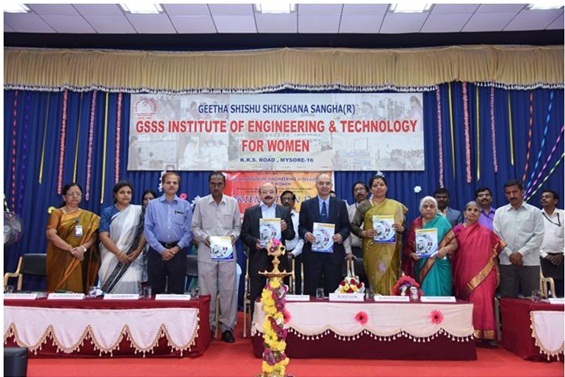 R K Bharath, Chief Executive Officer & Management Committee member, GSSS (R), Mysuru; Dr. A T Eswara, Professor and Head, Department of Mathematics, GSSSIETW, Mysuru; Dr. Bellappa S, Professor and Head, Department of Chemistry, GSSSIETW, Mysuru were seen. One Day Faculty Development Program on “Engineering Education at Cross Roads and Strategy for World Class Universities” by Prof. Dr. B.V.A.Rao Formerly Professor, IIT Madras & Adjunct Professor, NIAS, Bengaluru, was Organized by Department of Basic Sciences under Science Forum on 11th March 2017. (From left): Dr. A T Eswara, Professor & Head, Department of Mathematics, GSSSIETW; Dr. Sumithra Devi K A, Principal, GSSSIETW; Prof. Dr. B.V.A.Rao (Speaker), Formerly Professor, IIT Madras & Adjunct Professor, NIAS, Bengaluru and Participants. A Special Talk by Dr. Bettadaiah B K, Senior Scientist, Spice and Flavour Science Department, CSIR-Central Food Technological Research Institute (CFTRI), Mysuru, on “NMR: Instrumentation and Applications" was organized by the Department of Physics on 22nd April 2017 to all first year B.E. students. (From left): Dr. Bellappa S, Professor & Head, Dept. of Chemistry, GSSSIETW; Sri Yogesh M, Associate Professor & Head, Dept. of Mechanical, GSSSIETW; Dr. Bettadaiah B K, Senior Scientist, Spice and Flavour Science Department, CSIR-Central Food Technological Research Institute (CFTRI), Mysuru; Dr. Pushpalatha H L, Professor & Head, Dept. of Physics, GSSSIETW; Sri Venkatasheshaiah B, Associate Professor, Department of Mathematics, GSSSIETW.